Migrant Kids Reuniting With Parents In The U.S. Need Emotional Support To Thrive : Shots - Health News Most children moving to the U.S. from Central America come without adults, hoping to join parents or family already living in the U.S. To succeed, psychologists say, these families need support. Their mother, Fatima, had already been in the United States for more than a decade, working to provide money to fund a better life for her children. The girls had mostly been raised by a loving grandmother in El Salvador. But in 2016, when the grandmother died after a prolonged illness, some relatives started petitioning to have Ericka and Angeles put into a government-run institution as "abandoned" children. 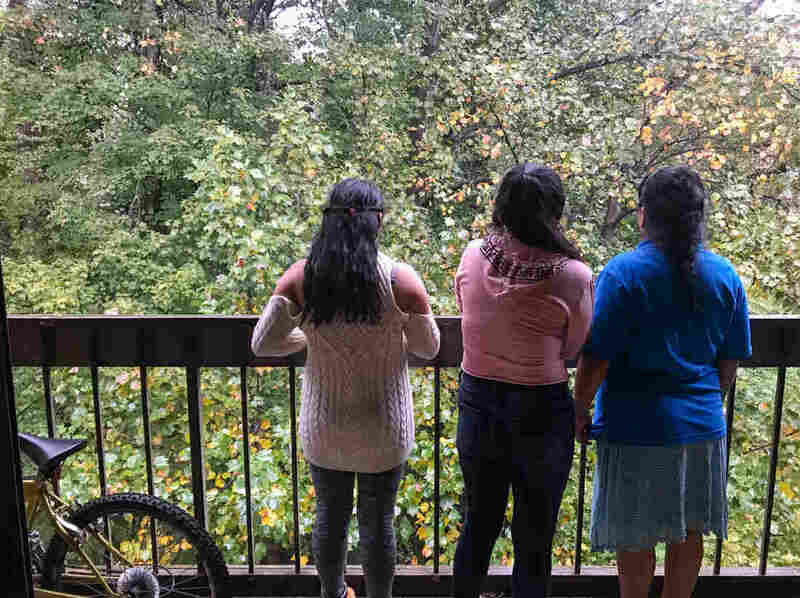 By September of that year, the girls, an older brother and their mom decided that the time had come for Ericka and Angeles to take whatever chances necessary to get to America to reunite with their mother, who lives in a Virginia suburb of Washington, D.C.
Theirs is a common experience, say psychologists who work with migrant families in the U.S. Like these two sisters, most Central American children coming to the United States in recent years have arrived unaccompanied, fleeing from violence or poverty or because there was no longer anyone to take care of them in their home country. U.S. Customs and Border Protection reports that, between 2010 and 2017, officers with the agency intercepted roughly 300,000 unaccompanied children. Many had at least one parent or a relative already living in the United States — these young people came to be reunited with family. But, that reunification is rarely as easy or joyful as the children or their parents expect, at least initially, say researchers and therapists who work with these families. Years of separation, a history of grief and trauma, and the stresses of suddenly having to adapt to a new culture often get in the way. And the cost of unhappiness at home can be high for such youth. They may be be at a higher risk of depression, anxiety and substance-abuse, says Rachel Osborn, a licensed social worker at Mary's Center, a health clinic in Washington, D.C. And an unhappy family life can make it even less likely that those who are struggling in school will complete their education. "What these families need is access to bilingual mental health help," says Benjamin Roth, an assistant professor at the University of South Carolina's school of social work, who has interviewed unaccompanied migrant children. With that sort of help these children can integrate well into their new homes, say Roth and others, although many families are not getting the help they need. Before Ericka and Angeles could even see their mother, they had to spend a few weeks at the southern U.S. border, shuttled between a detention center and a shelter. Finally, they boarded a plane to the D.C. area. As they waited for Fatima at the airport, along with a chaperone from the shelter, Ericka wondered if she'd even recognize her mother. "I practically didn't remember her anymore," says Ericka, "because I was very little when she left." Ericka was around 5 years old and Angeles still a baby when Fatima moved to the U.S., though Fatima had always stayed in close touch with her family through the years. Their meeting at the airport was emotional. "I just wanted to hug them and touch them," Fatima says. "As a mother you want your children to be with you." They were beyond happy to be together. But the first months were difficult for them all. There were a lot of conflicts, says Fatima. Angeles, now a budding adolescent, acted out at home, especially when Fatima asked her to follow certain rules, like going to church with her on the weekend, and avoiding certain kinds of popular music that her mother found too racy. There was trouble in Angeles' school, too. "She would be rebellious in school," says Fatima. "Sometimes her schoolmates would tease her because she didn't speak English." But the teenager would respond defiantly, insisting on speaking only Spanish. Angeles was also hungry all the time, says Fatima, and she'd take frequent bathroom breaks at school — common symptoms of the stress she was feeling at the time. Ericka struggled, too. The more introverted of the two sisters, she withdrew and frequently complained of chest pain and had nightmares. "In the beginning, I would have dreams and I would wake up," the 19-year-old says now. Ericka's nightmares were about the girls' weeks on the road to the United States, never knowing at the start of each day where they would sleep that night, or if they were safe. Ericka didn't speak English, which made everything at school difficult, she says. "It was a little hard, because you have to adapt to something new. How do you start over?" Ericka and Angeles with their mom, at home in a Washington, D.C., suburb. It's been two years since the family was reunited, and the girls say they're starting to feel more settled. As time goes on, Ericka says, "the hard times get left behind." Both sisters desperately missed their now 22-year-old brother, who had always tried to look after the girls, especially after their grandmother's death. "We were always together since we were very little," says Ericka. "And we had never thought that at some point in our lives, we'd have to be separated." 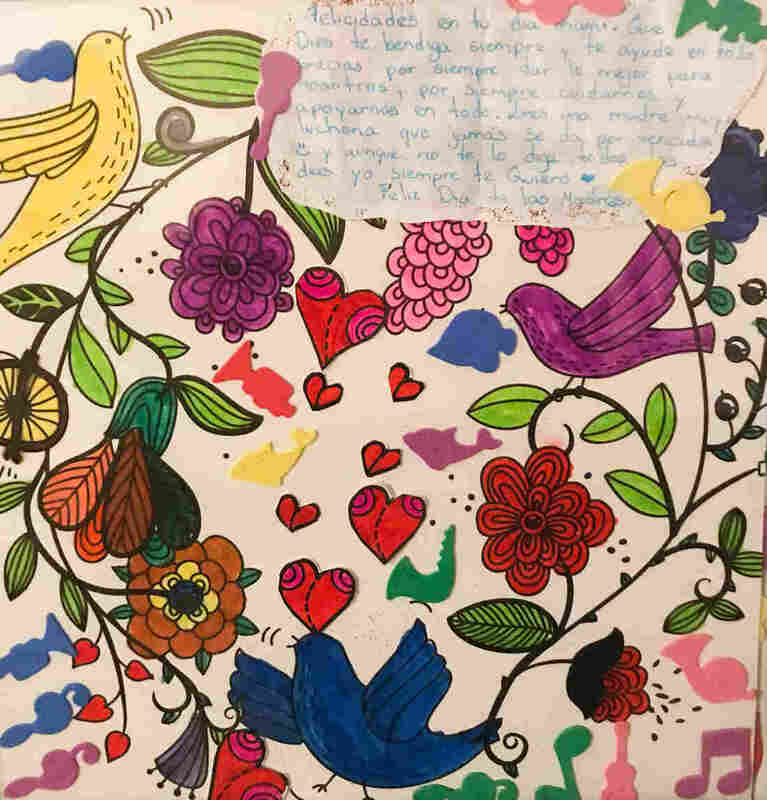 This longing for family left behind, the nightmares, the stress-eating and acting out are common symptoms of stress and trauma among unaccompanied children who come to the U.S., say teachers and health workers who treat these families. 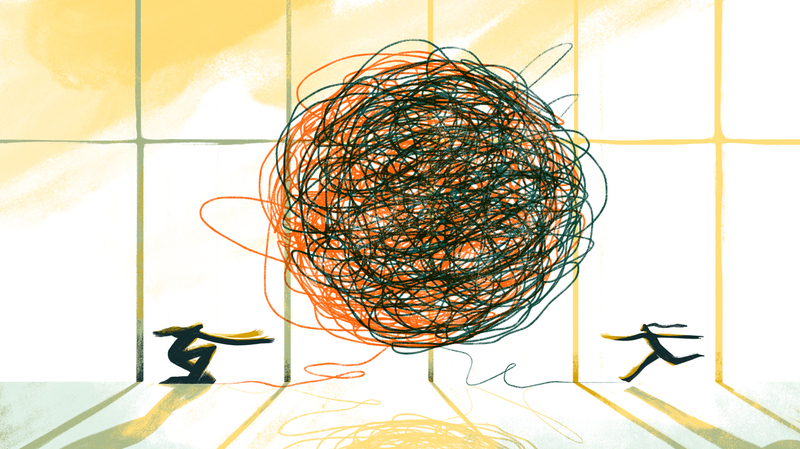 "The kids often are behaving badly at school and at home," says Rosario Carrasco, a parent-liaison at Angeles's school in Fairfax, Va. "They can't really develop relationships with others in school. It's really difficult for them." "To try to understand what it's like to be an unaccompanied minor or any migrant youth, you really have to suspend your belief about what's normal," says Osborn. "It's a totally different existence for these kids. They're navigating so many different changes at the same time." The journey to the U.S. without the protection of a parent is traumatic, Osborn says, and that's just the start. Ericka and Angeles, for example, had to spend two days at a detention center in the U.S. and nearly a month at a shelter, where they were even separated from each other for a few days. "The entire journey, we tried to stay together and we didn't have to separate until we got there," Ericka recalls, starting to cry. "And so, it was really hard." The girls' had already experienced repeated separations from primary caregivers over the years — first from their mom when they were very young, then from their brother in El Salvador. And they barely had time to grieve the loss of their grandmother before setting out for the United States. Those types of traumas can leave a lasting mark on kids' psyches, Osborn says. Research studies done soon after World War II, for example, found that the separation from parents could make children more vulnerable to personality disorders and mental illnesses, like depression and anxiety. According to the Society for Research in Child Development, various other studies have shown that separation from parents puts kids at a higher risk for poor social functioning and problems in forming healthy relationships. These problems some work suggests, can persist even after reunification with family, and on into adulthood. "We found the longer the separation, the worse the [problems] — anxiety in particular," says psychologist Carola Suárez-Orozco of the University of California, Los Angeles and the author of one such study in 2011. Unfortunately, Osborn says, she sees all these issues among the children she works with. "Kids might feel resentful," she says. "They might feel abandoned." And they often don't know how to express their feelings, says Roth, the researcher in South Carolina. "Kids process stress in different ways and sometimes they manifest in psychosomatic symptoms." It's difficult for the parents, too. "Parents feel like they've abandoned their son or their daughter, and they feel like it's something they can't forgive themselves for," says Carrasco. "They feel incredibly guilty." These adults often are struggling to cope with traumas in their own lives. "They've made these enormous sacrifices and they've probably been in survival mode in the United States," says Osborn. Like Fatima, some parents of these children are in the U.S. illegally. "There's a lot of disillusionment from parents and kids, because they have a lot of lofty expectations about how beautiful things will be as soon as their family is reunited," Osborn says. "And in a lot of cases, we see that it's rarely that easy." But getting the right sort of mental health support can make a huge difference for kids and their families, Roth says. When translated into English, this gift to Fatima from her eldest daughter says: "Happy Mother's Day! May God always bless you and help you with everything. Thank you for always giving us the best, and always taking care of us and supporting us in what we do. Even though I don't tell you this every day, I always love you." Luckily for Fatima and her daughters, they got that sort of help through a program in Virginia's Fairfax County Public Schools system called Families Reunite. It's a three-day workshop that aims to accomplish some of what talk therapy might accomplish over a longer period of time. "I truly believe that a family that is given the proper tools, can overcome all this," says Carrasco. The most important of tools, she says, is improving communication. Initially, she says, most families she has worked with tend to not talk about things that have hurt them. Carrasco helps change that. "The kids, for example — we have them tell their parents what their life was like in the country they came from, [and] what they like to do," says Carrasco. "And oftentimes they also express how much they miss the people they left behind." The parents, too, are invited to talk about their history and the sacrifices they've made to establish themselves in the United States. Carrasco says she encourages the parents and children to sit down and speak openly with each other, so that as they go forward they can resolve any issues that may arise as they reforge family bonds. She helps the parents let go of the guilt they still feel for having left their children behind. And she reinforces positive parenting skills. "It's showing parents that they need to recognize the positive things the children do," Carrasco says, "not just the negative things." Fatima and her younger daughter Angeles participated in the school district's workshop last year, and they say it helped them. "I listen to my mom now, and I understand her," says Angeles. "Before, I didn't really understand where she was coming from." When I visit the family on a Saturday morning, Angeles is busy writing in a large notebook. She shows off her doodles and an essay she has written in Spanish. "Many people travel to the United States," she reads aloud in Spanish, as Ligia Diaz, another parent-liaison from the local public school system, translates it into English. "Many make it across the border. Others don't cross." Angeles' writing touches on the stories of the children she's heard about in the news — kids separated at the border from their families in recent months. Then, she recounts her own story, with a hint of the gratitude she now feels for her mother. "I arrived here one year ago. And I have my purpose," Angeles reads. "My purpose is to help my mom, because of all the different things she has done for me." These days, the teen says she tries to do what her mom says, like putting more time into her homework and into learning English. She also helps her mother at home when she's cooking meals for the family. Angeles and her sister still struggle — with speaking English and fitting in at school. And they miss their brother. But, Ericka says, they have already come a long way. "As time goes on, you get used to things," she says. "And the hard times get left behind." What helps along the way, she says, is having their mom with them now. "It's the only thing that makes me happy," says Ericka. "It's the only thing that gives me comfort."